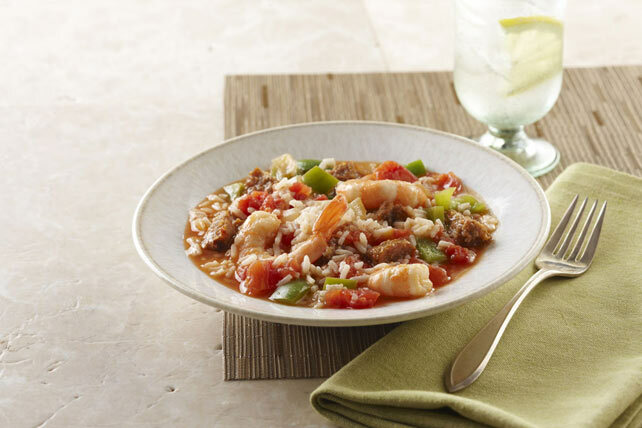 Enjoy the flavours of New Orleans with this easy-to-make version of a Louisiana classic. Cook sausage and onions in hot oil in large skillet on medium heat until sausage is done, stirring occasionally. Add remaining ingredients; mix well. Bring to boil; cover. Remove from heat; let stand 5 min. Fluff with fork. Serve with French bread and a mixed green salad tossed with your favourite Kraft Dressing.